Valentine’s Day is just around the corner, which means that it’s time to enjoy some sweet treats. Here are three simple recipes that almost anyone can enjoy and can be prepared in only a few minutes. Instructions: In one medium sized mug, crack an egg and beat it until it has a liquid consistency. It’s very important to make sure that this is mixed thoroughly. Then, add the powdered sugar and cocoa powder and mix it until the batter has formed. Microwave the batter in the mug for one minute. Once done, add any toppings and then microwave for another 15 seconds. Add any last toppings and enjoy! Allergy Concerns: This contains egg, and added toppings can be controlled to accommodate to any allergies. Instructions: Crush up the graham crackers and lay a thin layer of those and the sprinkles on the bottom of your bowl. Next, scoop the ice cream and sprinkle the remaining graham cracker pieces and additional chocolate sprinkles on top. At this point, you can add mini marshmallows, chocolate sauce, and chocolate chips to your liking. Allergy Concerns: If you have a dairy allergy or are lactose intolerant, the vanilla ice cream can be substituted with another version, such as almond milk or coconut milk ice cream. For the chocolate items, many dark chocolates are dairy and lactose free, and there are chocolate substitutes out there that can be used. There are also gluten-free graham crackers available that can be used for those that have issues with gluten. 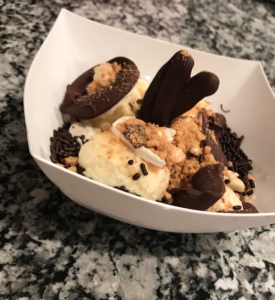 This dessert can be easily adapted for almost anyone to enjoy. 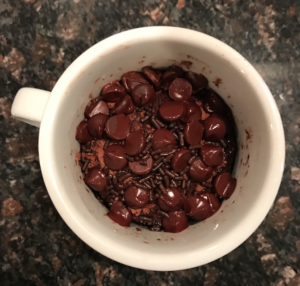 Instructions: Spread the chocolate chips evenly amongst a pan that has been covered in parchment paper or tin foil that has been sprayed with a nonstick spray. Heat the pan for approximately five minutes in an oven at 325 degrees Fahrenheit depending on the oven. Take out the pan and smooth over the chocolate with a spatula. At this point, you can add any toppings of your choice and gently pat them into the melted chocolate. Next, cover the pan with plastic wrap and place it in the refrigerator until it has hardened, which should take about an hour. Once hardened, you can break the bark up in one of two ways: manually with your hands or placing it in an airtight ziplock bag and hitting it. Now that your bark has been broken up, enjoy! Allergy Concerns: If you have a dairy allergy or are lactose intolerant, many dark chocolates are dairy and lactose free, and there are chocolate substitutes out there that can be used. There are also gluten-free pretzels available for a topping substitute, but since the bark is customizable, you can avoid items that contain gluten, dairy, or nuts if you need to. Possible Toppings Combinations: For a salted caramel bark, you can add crushed pretzels and caramel sauce to the bark. 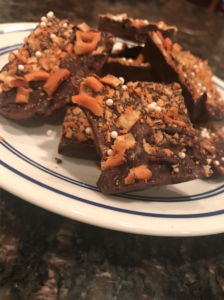 The bark pictured here has pretzels and sprinkles on top as an example of a possible combination for someone looking for something both sweet and salty. All of these desserts are quick, easy, and don’t take too much time to prepare. They also can all be easily made to your liking, so take some time and treat yourself or others this Valentine’s Day!